This perennial originates from China, where they have been cultivated for over 2,500 years. 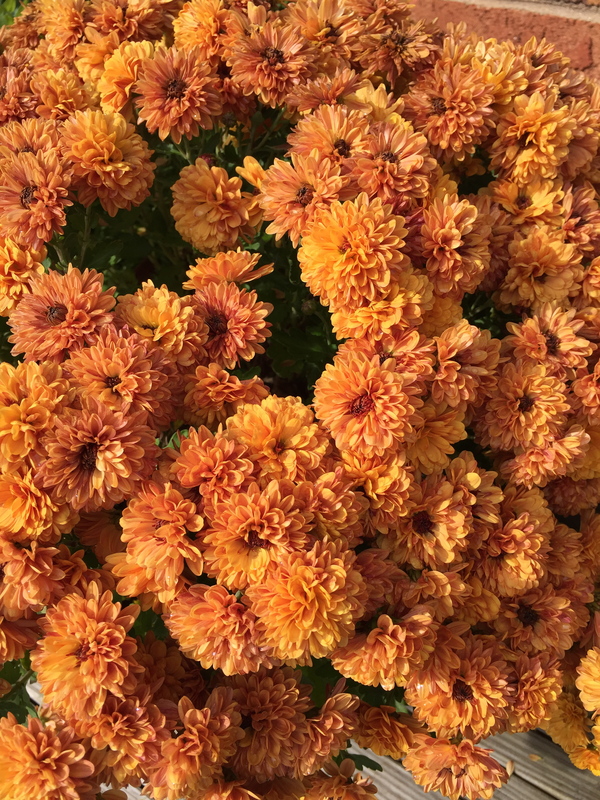 Chrysanthemums were used medicinally and for flavoring, as well as for ornamental purposes. 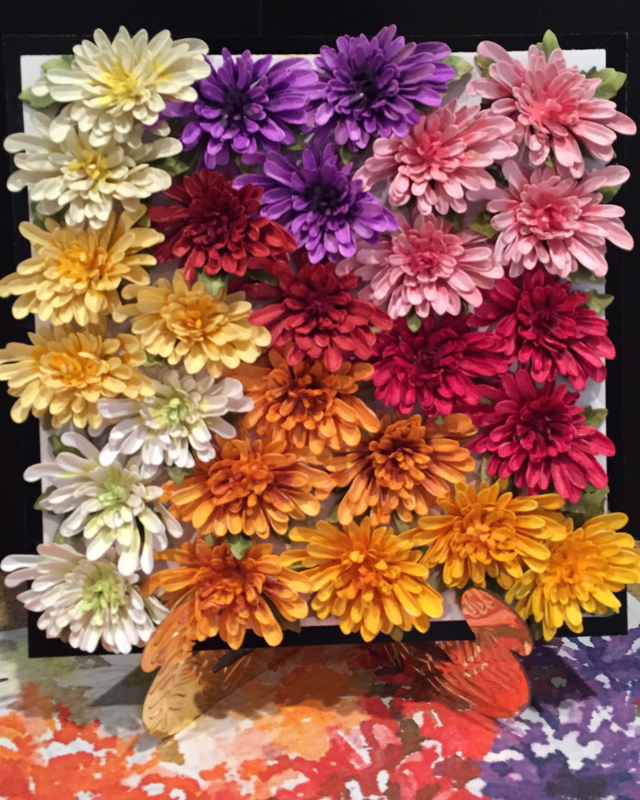 Notably, the Japanese have adopted chrysanthemums and used them in their art as a symbol of longevity and happiness. There is a gleam of white and gold. The white of winter’s cold. 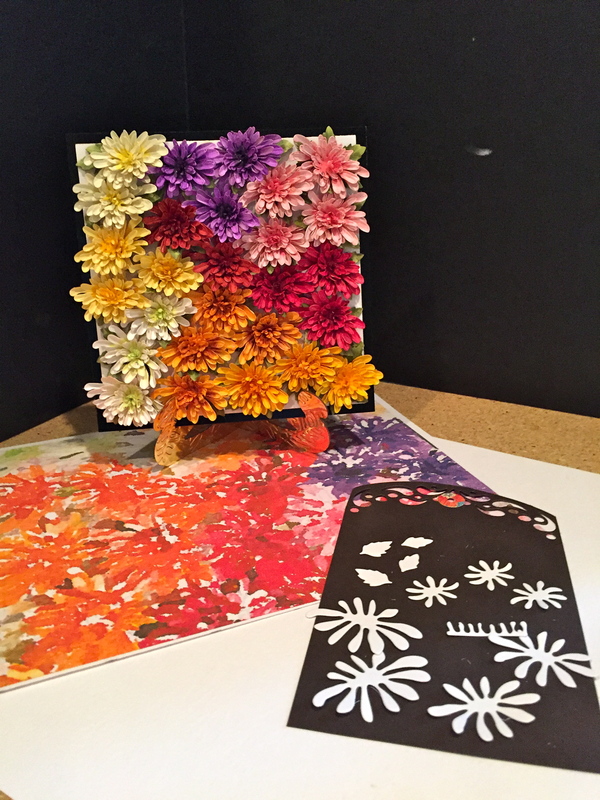 For this project, I wanted to share with you how I color and shade white cardstock to get the most natural looking flowers – which is what I’m known for. Die cut a tag from Els van de Burgt Studio’s Tags & More 6/Sparkle; mine is 4 1/4” x 7” and I used 80lb. glossy black cardstock. Cut a rectangle 4” x 5 1/2” from patterned paper of choice. I used a photo I took of a project I did with chrysanthemumsms and Soft Finish Cardstock (I converted a photo of the project with a watercolor filter using an app (Waterlogue) on my iPad). 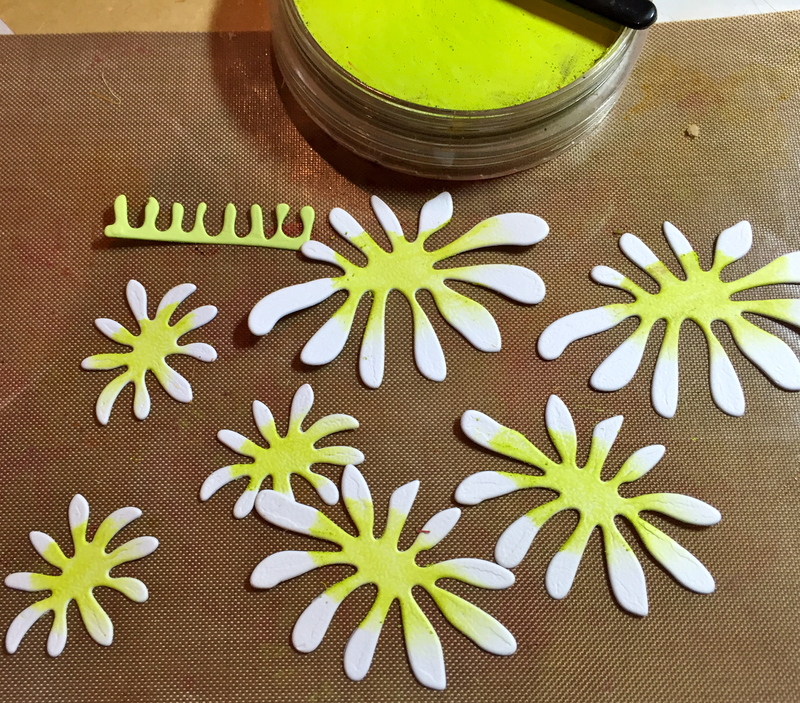 Next, die cut the chrysanthemum pieces with Soft Finish cardstock. 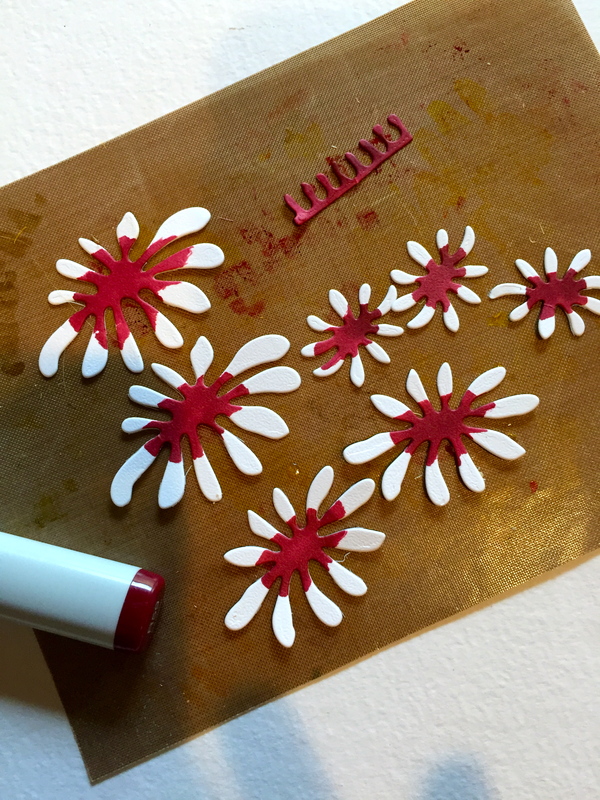 Place chrysanthemum pieces on a non-stick sheet. Use Copic markers to color and PanPastels to shade. 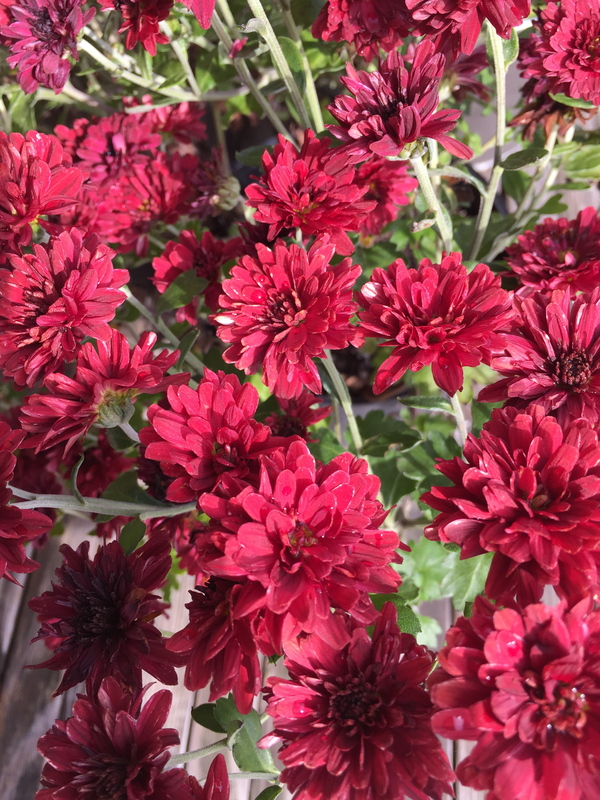 Use R59 for the darkest shade toward the center of the claret-colored flower. Use R37 for the remaining petal. 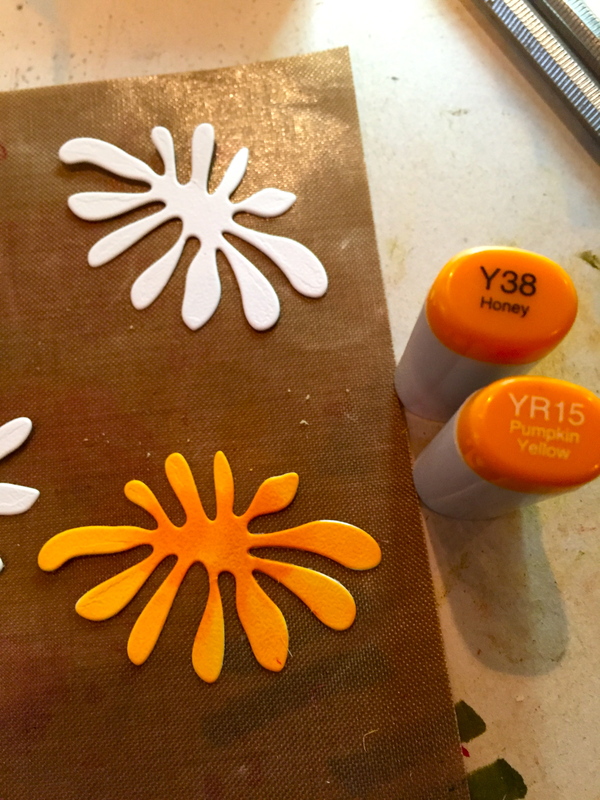 Use YR15 and Y38 for the deep yellow flower, but add PanPastel Permanent Red Extra Dark for this variety. Finally, simply shade white cardstock with PanPastel Bright Yellow Green in the center. Die cut the center petal (the one I roll up) in a bright green cardstock. Die cut the leaves in a medium green cardstock. Shade the edges with Distress Ink/Crushed Olive and highlight the stem with the PanPastel Bright Yellow Green. Shape on the Leaf Pad, using the Leaf Tool. 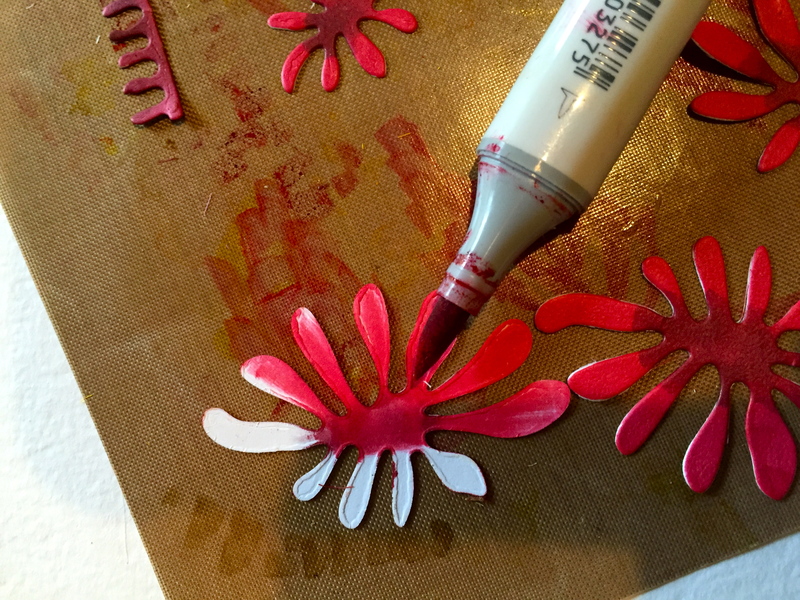 Dip the stem end into glue and set them in place under the flowers you’ve added to your project. I decided to put the tag on a wine bottle package that I’m bringing to friend’s house for Thanksgiving. So, I die cut Quietfire Design’s ‘Thanks’ in the same glossy black cardstock that I used for the tag. What a wonderful tutorial. Wish you could add a Pinterest button to the photos so I could easily pin it. I love the patterned paper hole reinforcement on the tag. This is a beutiful project down to the last little detail. Great tutorial Susan they are just beautiful! Amazing! 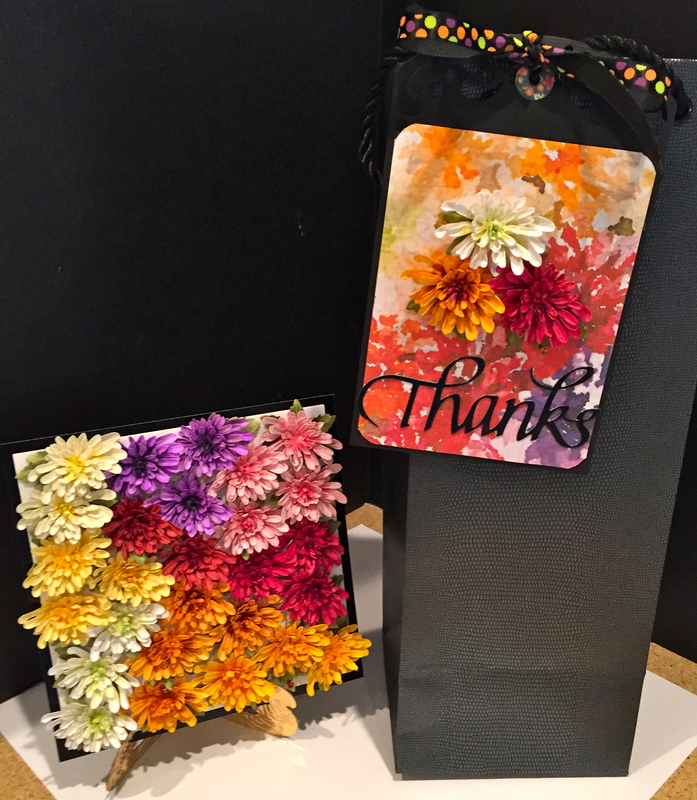 Can’t tell the difference between the cardstock flowers and the real ones! GORGEOUS, as usual!